This news item was posted in Breaking News, Pakistani News category and has 1 Comment so far . President Asif Ali Zardari pressed the United States during a NATO meeting on Sunday to help find a “permanent solution” to U.S. drone strikes that have fueled tensions between the two uneasy allies. “The president said that Pakistan wanted to find a permanent solution to the drone issue as it not only violated our sovereignty but also inflamed public sentiments,” Zardari spokesman Farhatullah Babar said in a statement after the Pakistani leader met with U.S. Secretary of State Hillary Clinton on the sidelines of the summit. The statement did not specify what such a solution might entail. The tempo of drone strikes, the centerpiece of U.S. strategy to fight militants based in Pakistan, has increased substantially since President Barack Obama took office in 2009. Zardari also called for the United States to do more to make amends for the deaths of 24 Pakistani soldiers killed in November by U.S. aircraft along the border with Afghanistan. Pakistan has demanded a high-level apology for that incident, which the White House has resisted so far. President Zardari accepted a last-minute invitation to attend the NATO summit, focused on outlining a NATO path out of the long Afghan war. There, he is likely to be pressed by Western leaders to crack down on militants attacking Karzai’s government and NATO forces in Afghanistan. Pakistan defends its record against militants and points out that many of its own soldiers have died in that fight. Zardari’s talks with NATO leaders may be overshadowed by NATO demands that Pakistan reopen ground routes used to supply alliance soldiers in Afghanistan. Pakistan closed those routes after the November border deaths. It’s unclear whether a deal reopening those roads will occur this weekend as U.S. officials had hoped earlier in the week. Zardari also voiced support for efforts to broker a peace deal between the Afghan government and the Taliban, whose leaders are believed to live in Pakistan. “The president said that Pakistan strongly supports an intra-Afghan and Afghan-led reconciliation process and believes that no military solution alone can find a permanent resolution to the problem of militancy and extremism,” Babar said. The Obama administration had hoped to make progress by the Chicago meeting in its effort to broker a peace deal. Initial talks were put on hold in March when the Taliban suspended its participation. 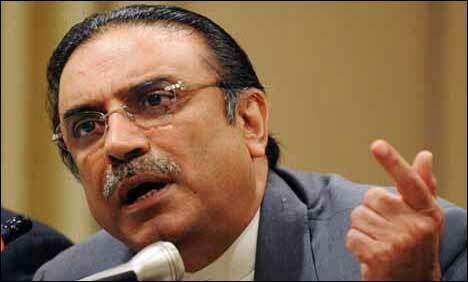 Zardari, who arrived in Chicago on Saturday, also met on Sunday with Afghan President Hamid Karzai.